What a difference a week (and a partner) makes. My friend and I talked to the instructors and were able to switch up our partners this week. I am so grateful for this, it honestly made my time at school a million times better. 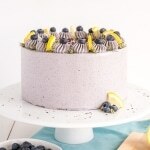 The fact that it was cake week helped too! Today was all about cheesecakes. 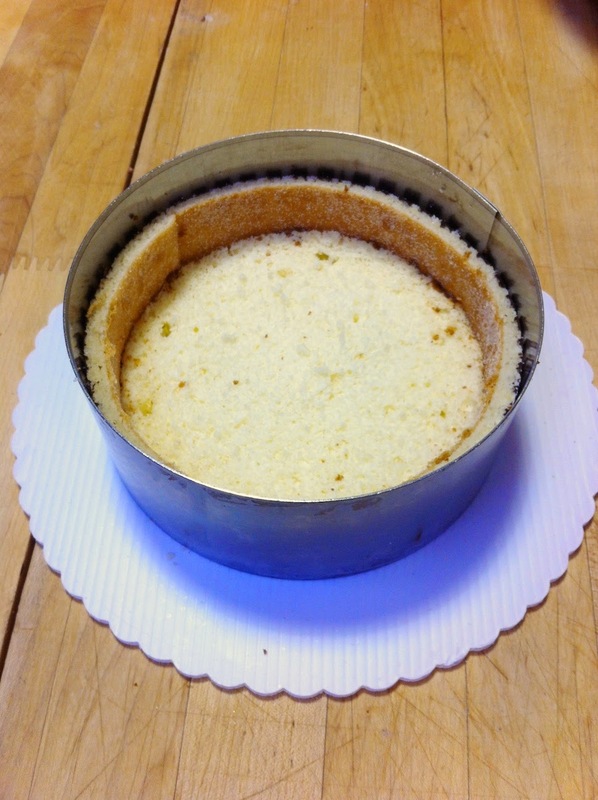 We made a total of 3 cheesecakes, all different. 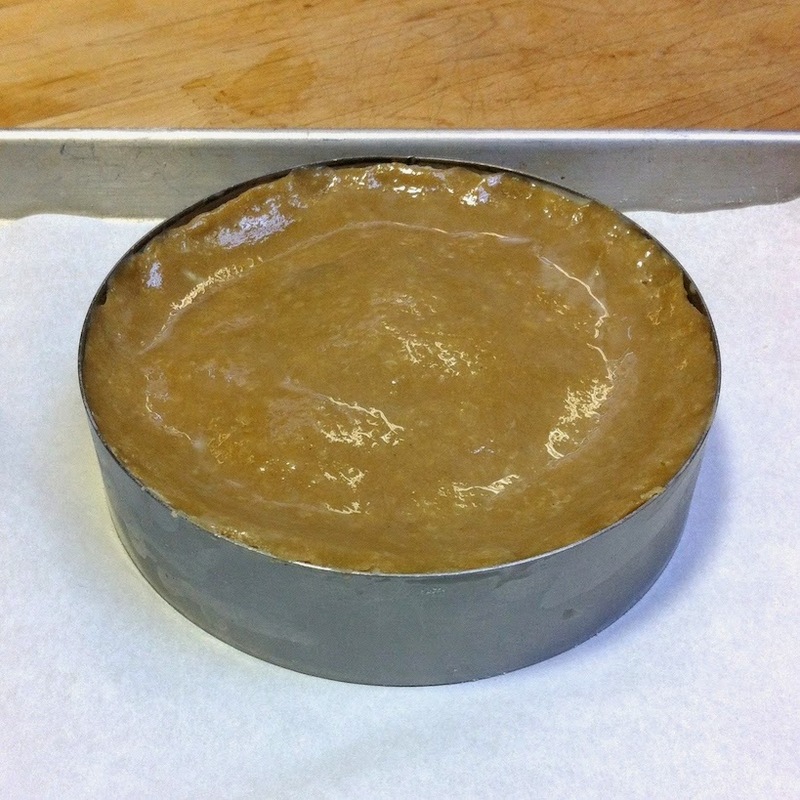 First step was making the crusts for the New York Cheesecake and Pumpkin Cheesecake. The New York one got a graham cracker crust (on the right) and the Pumpkin one got a gingersnap crust (left). 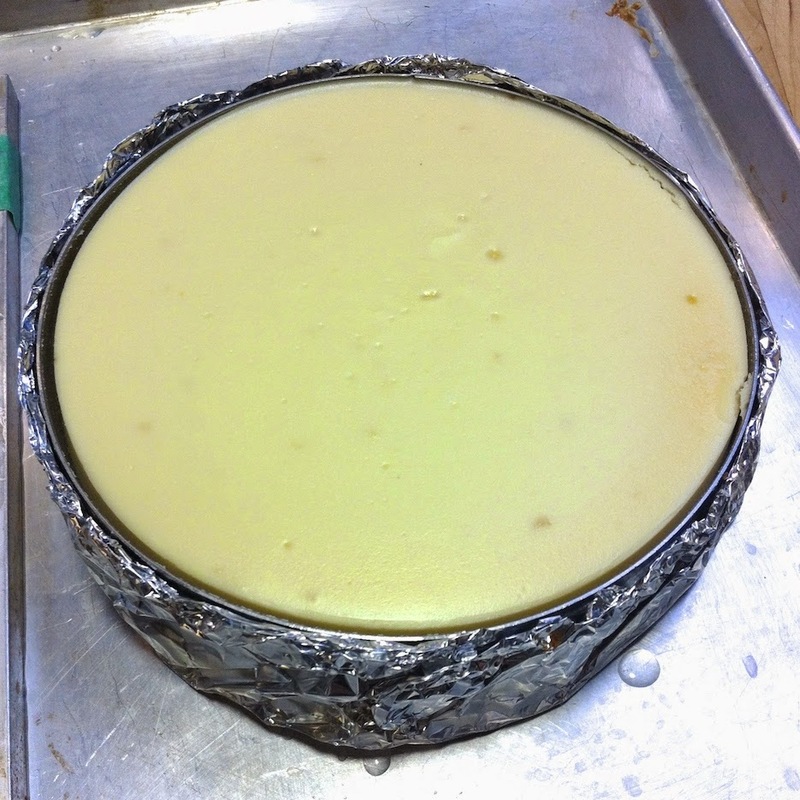 Once those were baked, we moved on to the cheesecakes themselves. First up was the New York Cheesecake. 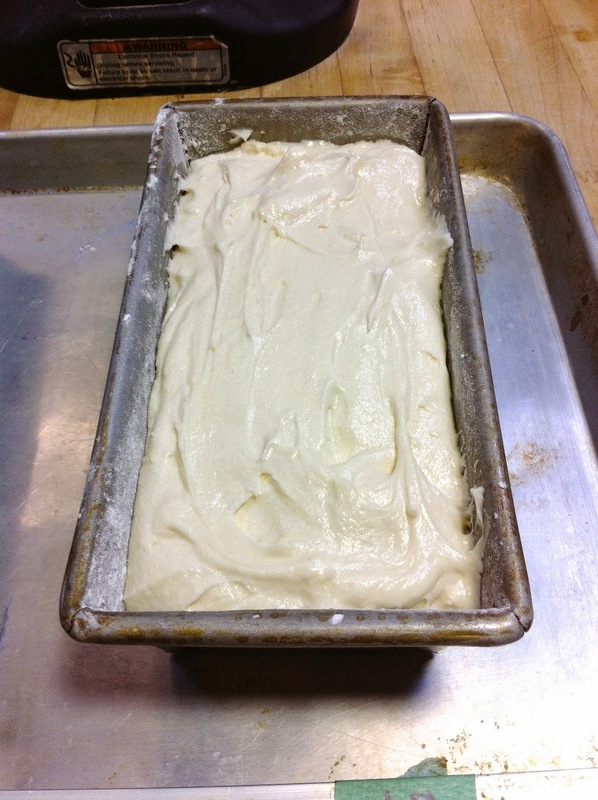 Here it is about to go into the oven in a water bath. We baked this guy for about 5 hours (!!). Started out with a high temperature, then kept reducing it throughout the day. I can’t remember the details and I’m too lazy to look up the recipe. Finished product came out great! No cracks is a good sign. Next one was the Pumpkin. 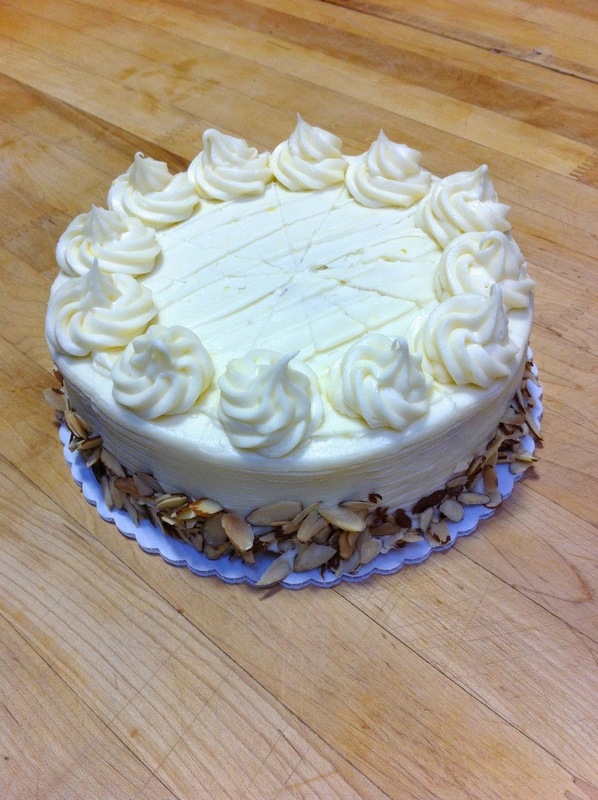 I should mention we used Philadelphia Cream Cheese for all of these cakes. 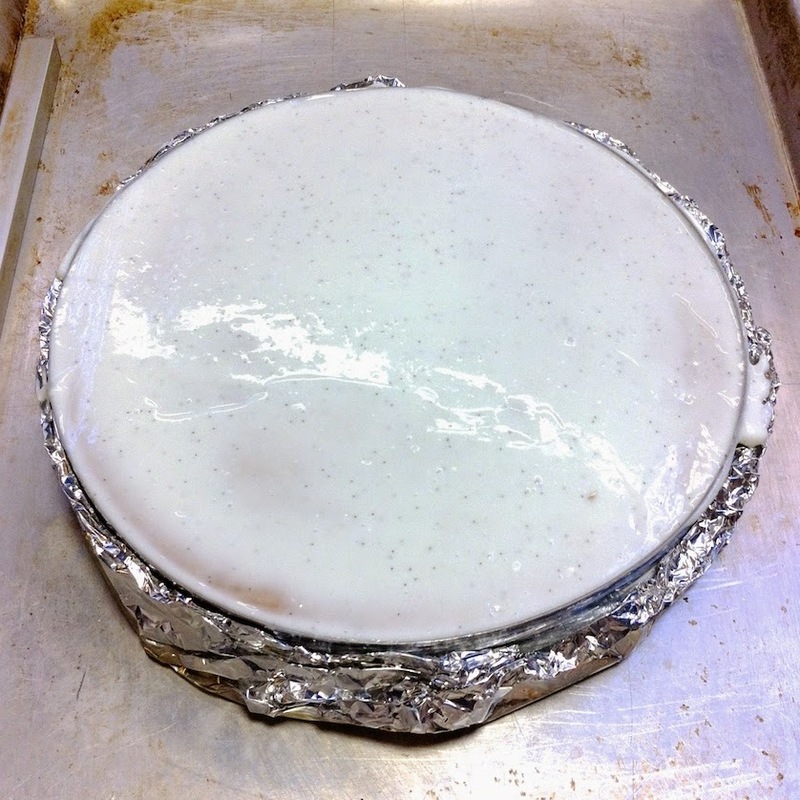 With sour cream glaze pre-2nd baking. 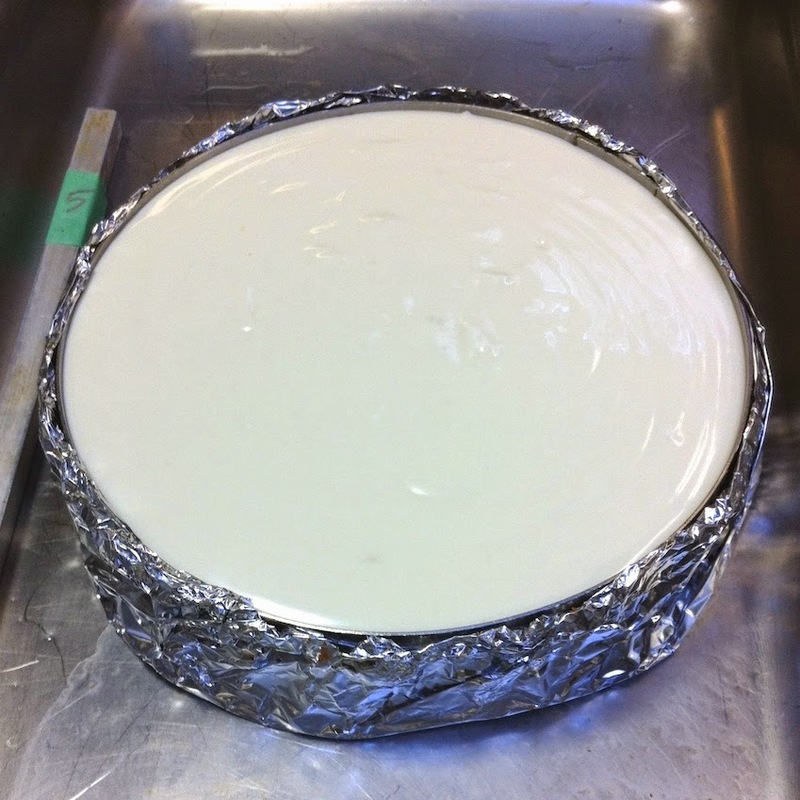 Finally, we made a German Cheesecake that used Quark cheese as well as cream cheese. 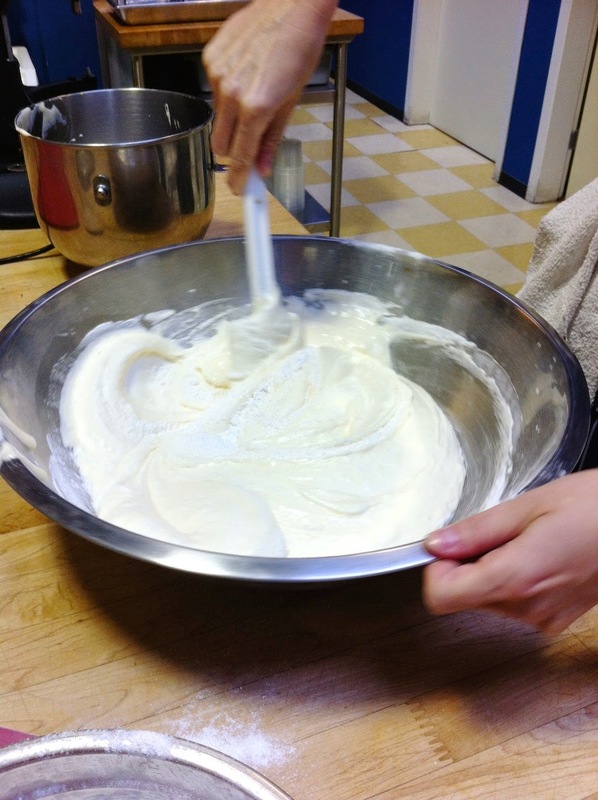 We also folded whipped egg whites into this one to give it a much lighter texture. 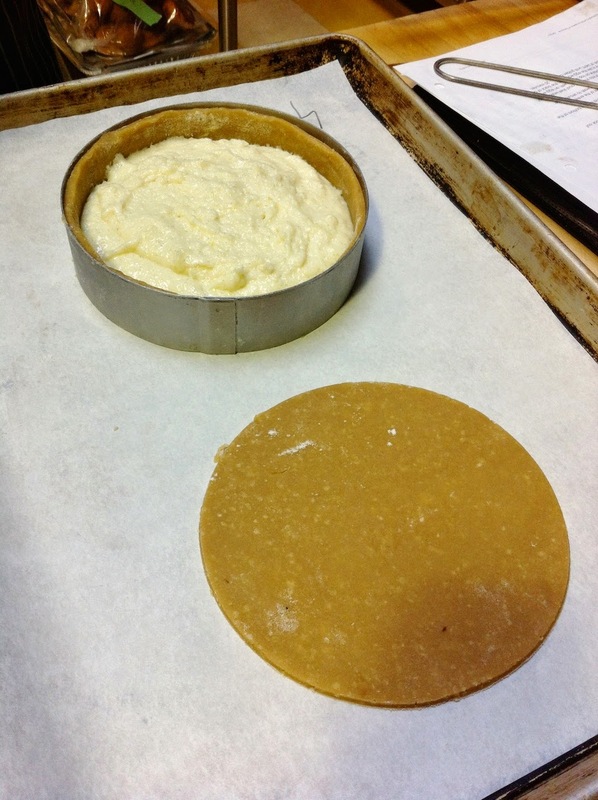 Pre- and post-baking pics. That’s egg wash on the top. 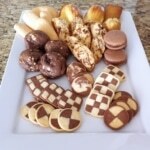 Sadly, we weren’t able to sample any of these today, as they needed to set in the fridge overnight. 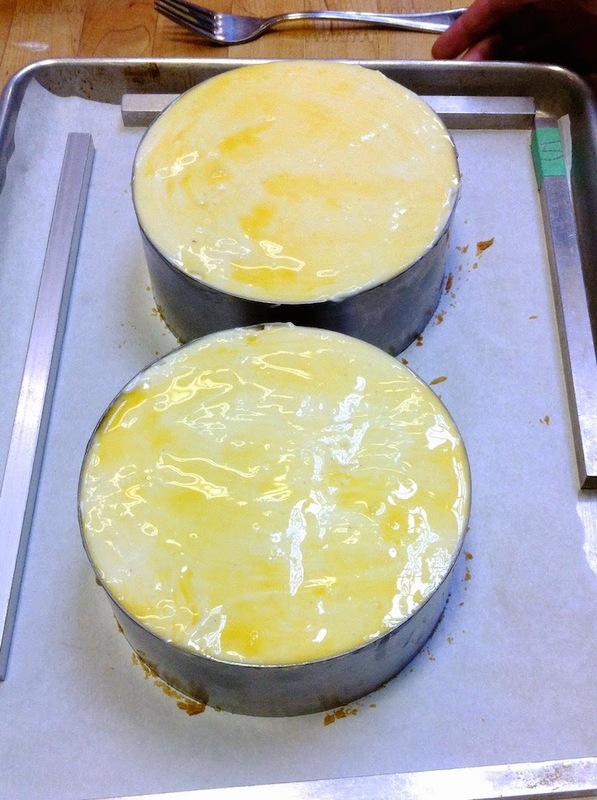 We started our day with de-panning and portioning all 3 cheesecakes. 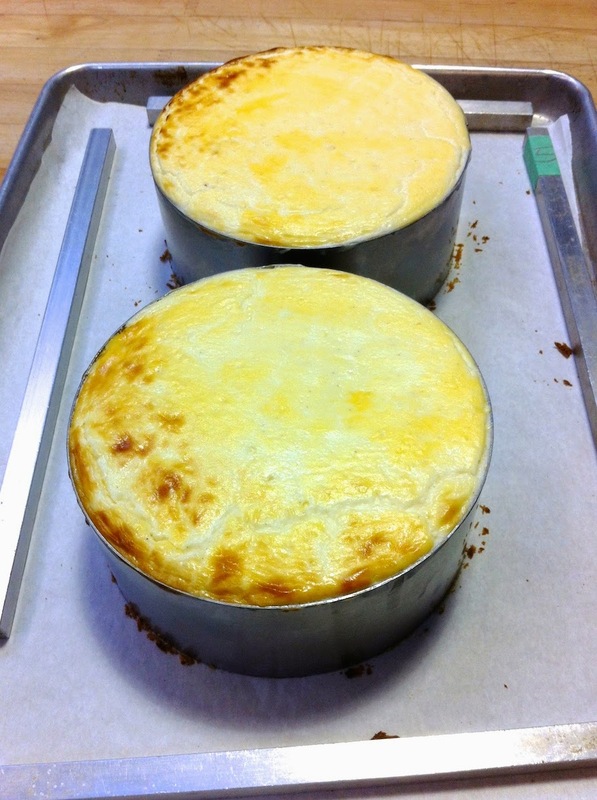 This was a bit tricky, as the cakes were stuck quite well to the sides of the pans and we had to warm the sides to be able to get them out. Last resort was taking a paring knife and running it around the edges. I’m happy to report no de-panning casualties. 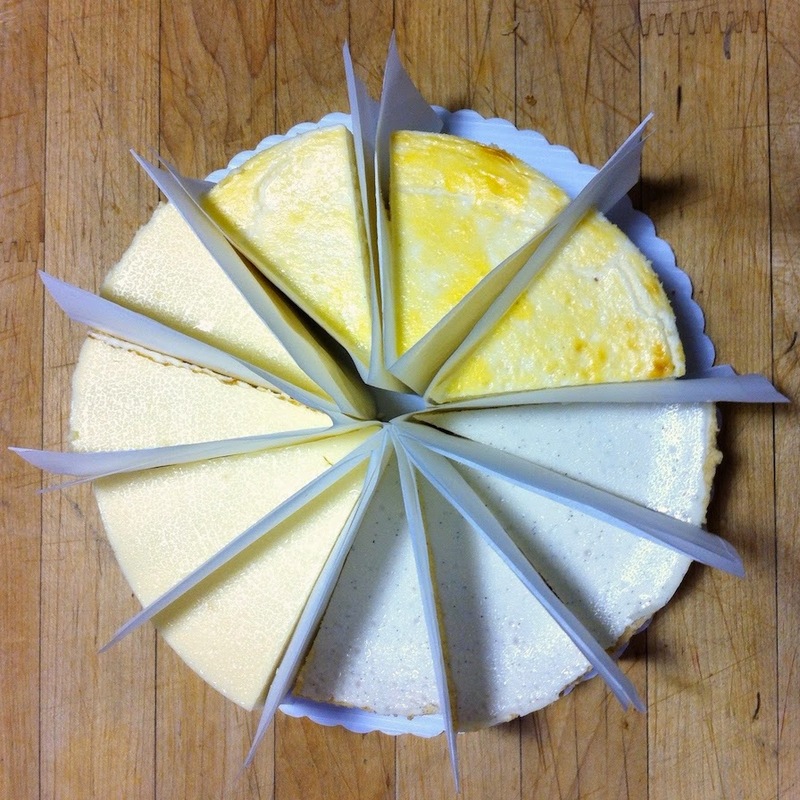 Here’s a shot of Halyee’s (my partner for the week) cheescakes all portioned up to take home. 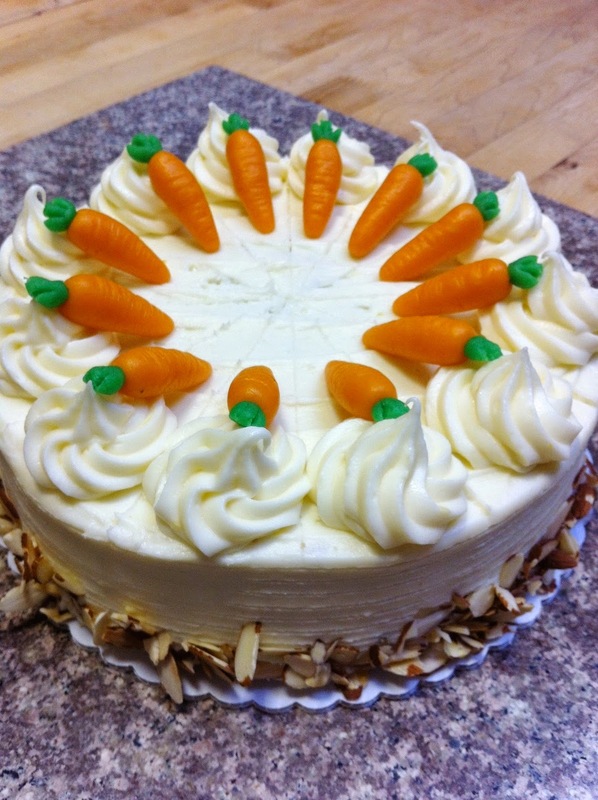 Next up was the carrot cake. I forgot to take a before pic, so this is all I got! 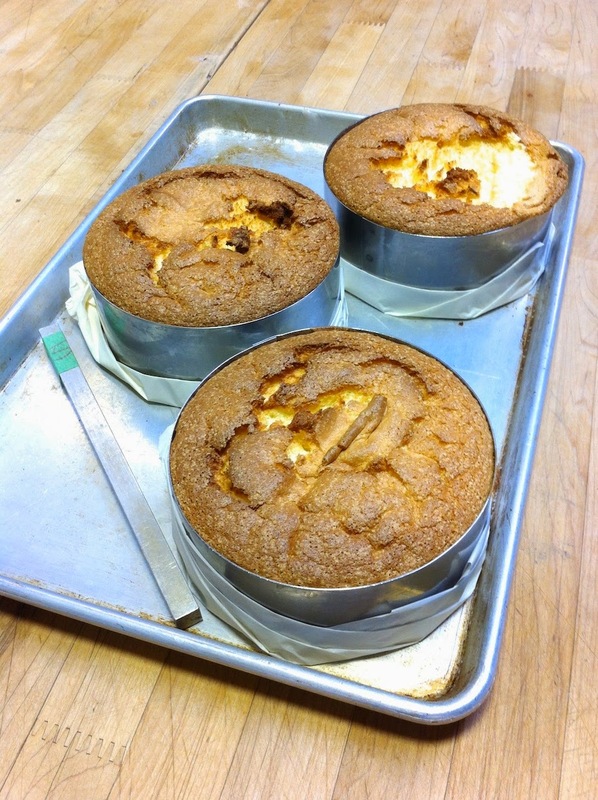 Unfortunately, the whole class used the wrong height pan for these guys and they crept up over the top. Ours suffered some structural damage on one side during the de-panning process, but I’m confident it can be saved. We’ll be decorating this guy tomorrow. 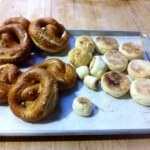 Btw the scraps I had taste amazing! 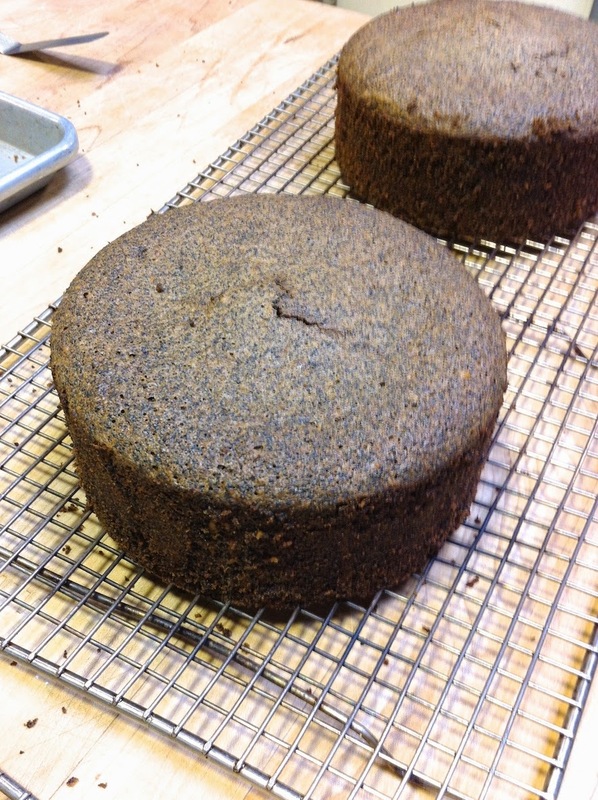 Next up were the Poppyseed cakes. These are mostly poppyseed (as you can see) and actually contain no flour – they are gluten-free. I’m very pleased that there’s only a little bit of cracking on mine, since it’s virtually impossible to get these to bake up crack-free. We’ll be finishing this one tomorrow as well. After that, we moved on to the intriguing Gateaux Basque. 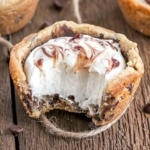 It’s actually a custard encased in a pie-like crust. 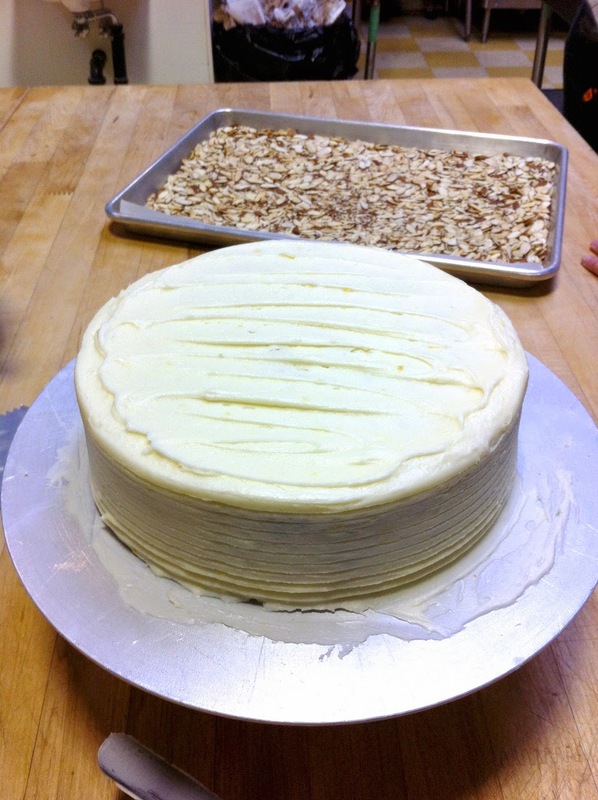 Here are some progress pics, first one is of Lindsay’s torte as I forgot to take a pic of ours (naturally). There is crust on the bottom and sides. 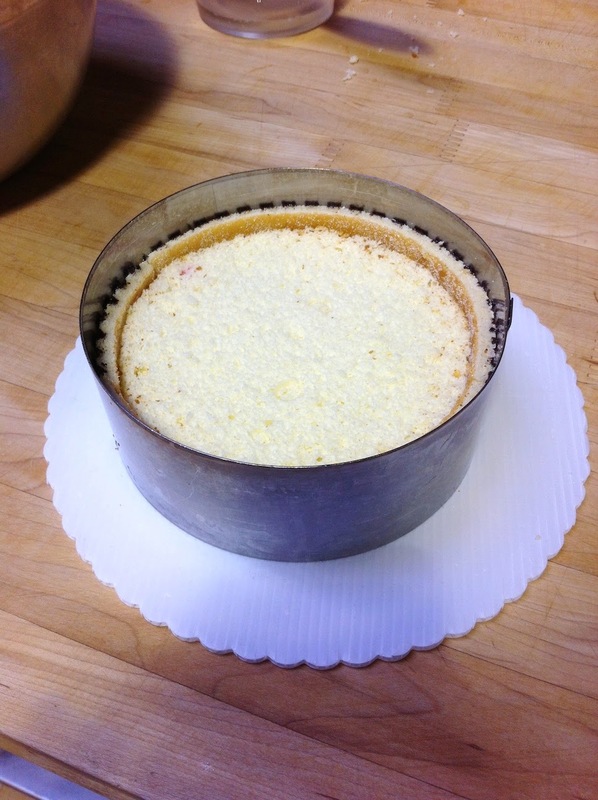 You then fill it with custard, add the top, and egg wash it. Let’s just say it looks better than it tastes. Not my kinda thing, but then again I don’t like custard-like anything. It does look impressive though! 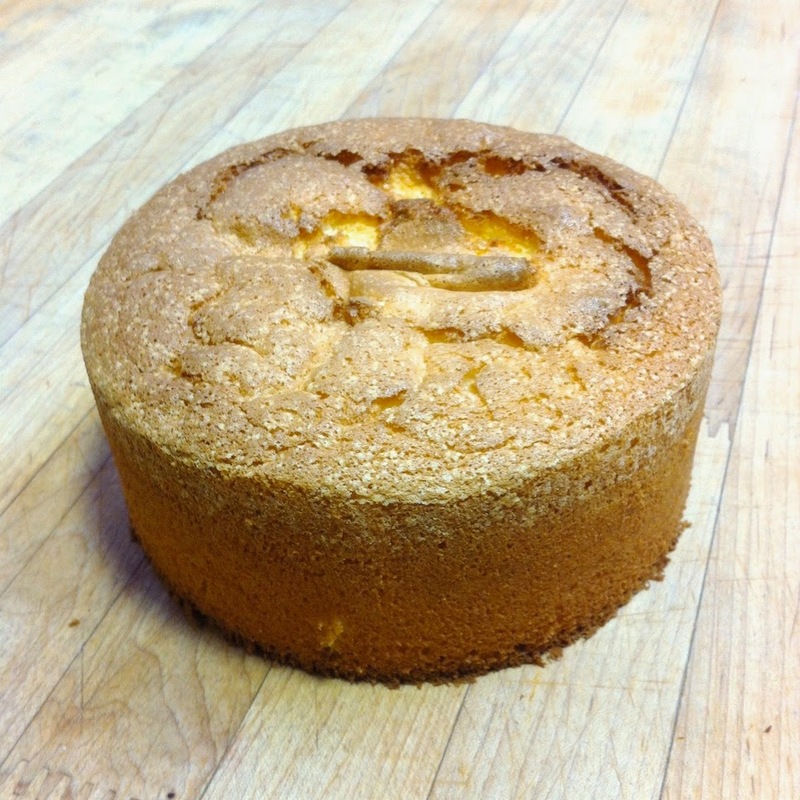 …and a Genoise cake which we’ll be using next week. It didn’t de-pan very nicely, but I don’t think it will affect the finished product. Whew that’s a lot of cakes for one day! 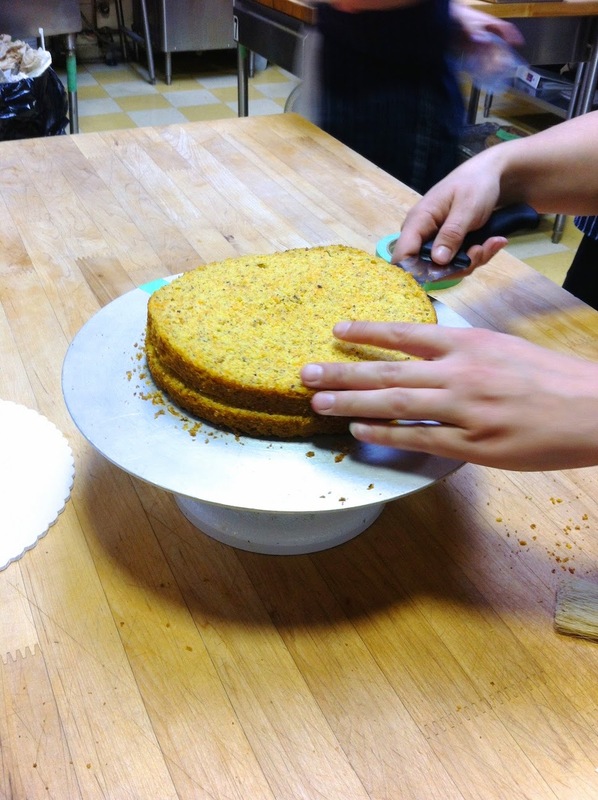 First up today was filling and decorating the Poppy Seed cake. 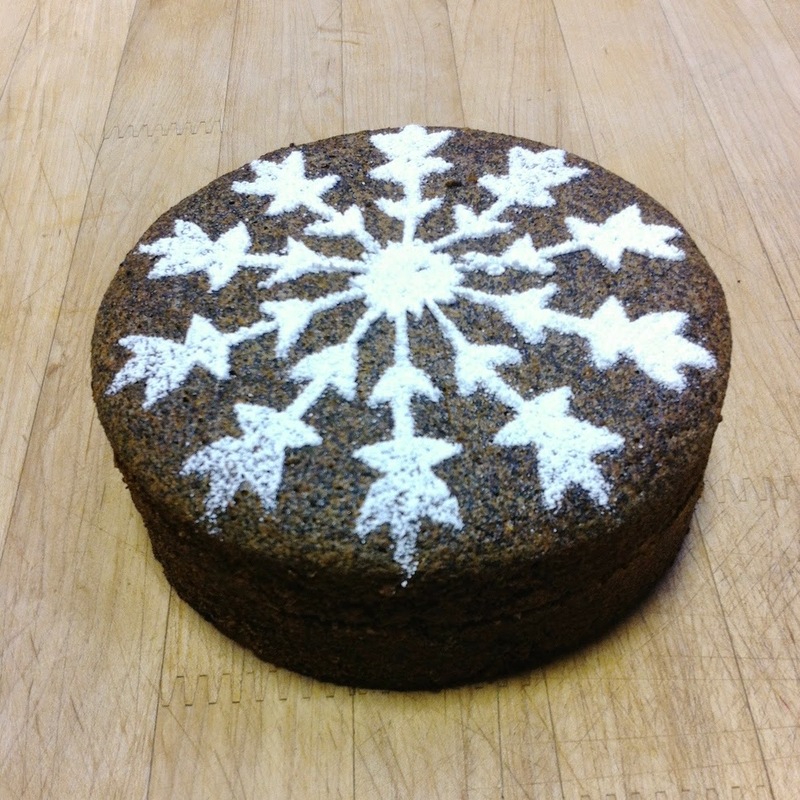 We sliced it in half and put a very thin layer of apricot glaze in the middle, then dusted the top with icing sugar using a stencil. This one has a very rich poppyseed flavor, which I love. 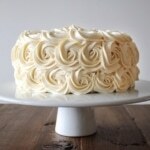 We’ll have to make this cake on our midterm and create our own stencil for it, so I need to get on that! 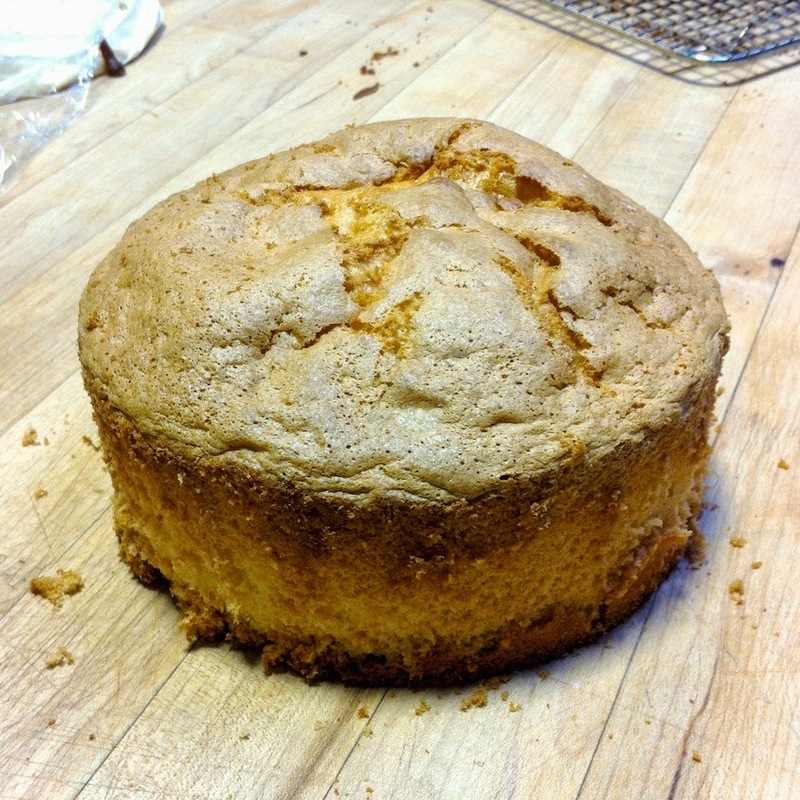 We also made a Pound Cake which involved a large volume of ingredients and an even larger bowl to fold them all together. Panned and ready for the oven. 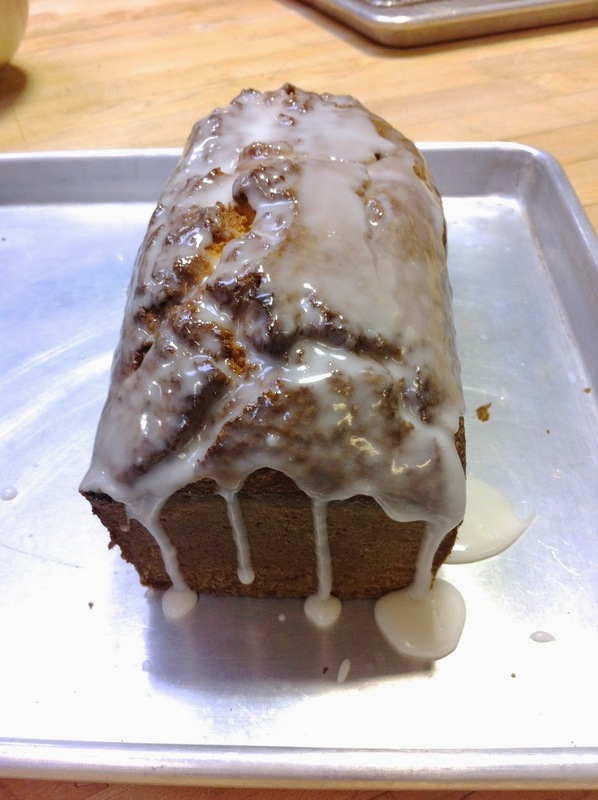 I love Pound Cakes. They’re not incredibly exciting, but I love them. Simple and delicious. This one has a nice lemon/orange flavor. Did I mention it’s delicious?? While our Pound Cakes were baking, we did a plating exercise with some mini pumpkin cheesecakes we baked with the extra batter. Under the cheesecake is a gingersnap crumbled crust, on the side of a cream cheese schmear (I can’t remember what was in this sauce… some quark cheese for sure, and cream cheese). The orange slices were cooked in a syrup with some vanilla and basil (which gave it a really unique and surprisingly delicious flavor!). Finally, topped with some concorde grape halves and a tiny sprig of mint. We also baked some Sponge Cakes, and unfortunately because ours rose so high (which is a good thing) they actually touched the bottom of the racks above and took some damage. Thankfully we’ll be cutting off the tops of these anyhow for cakes we make in a couple days. They de-panned quite nicely though! 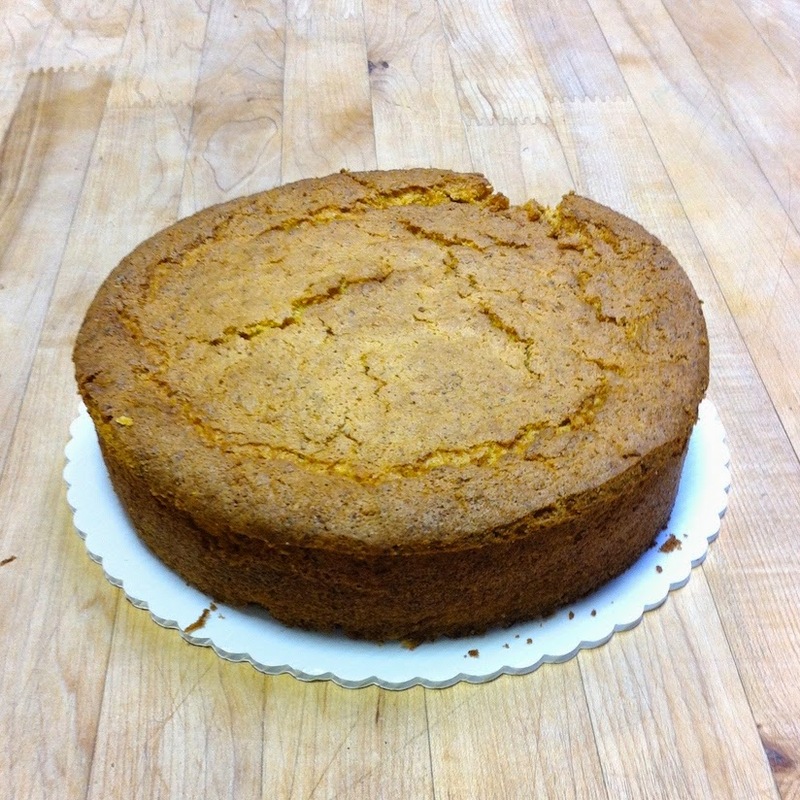 Much better than the Genoise… or maybe I just did a better job this time. 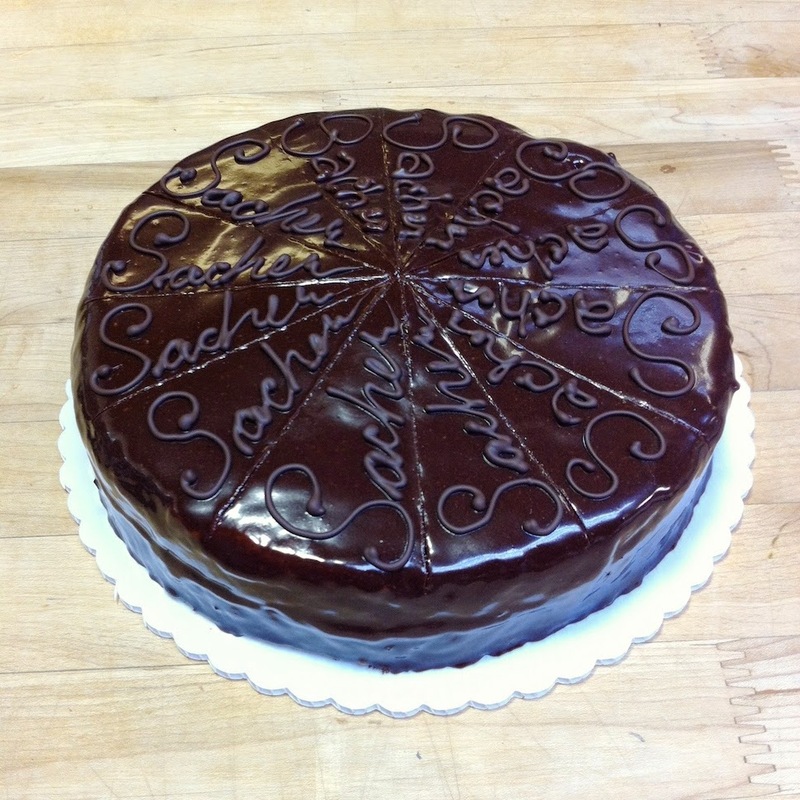 The Sacher Torte was up next. It’s an Austrian torte filled with raspberry jam and covered in ganache. 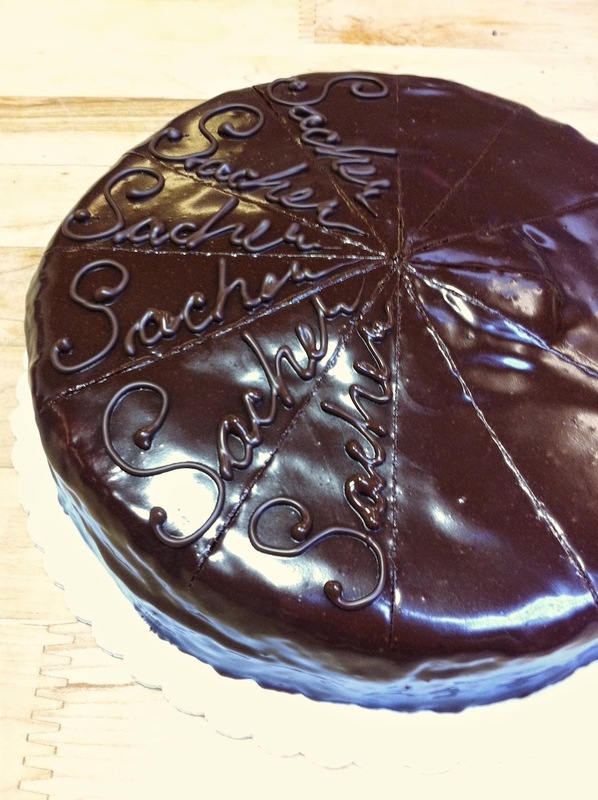 The traditional Sacher Torte has the word Sacher written on each individual piece, so we practiced our chocolate writing first. Next step was actually writing it on the cake… here’s my half done. I should have taken a pic of the cut slices. I need to remember to do that for all the cakes once we portion them. 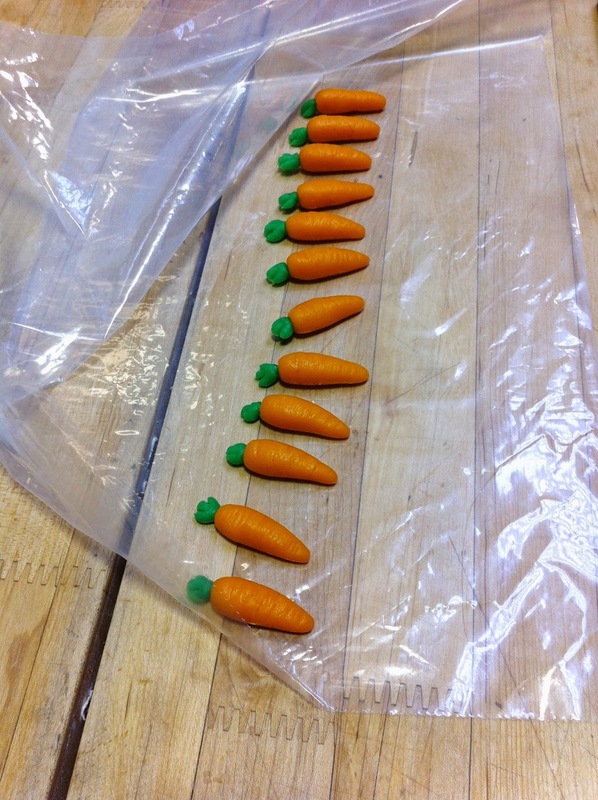 Portioning is usually done at the end of the day, and it’s a bit of a rush so I often forget! My partner, Haylee, cutting the cake into 3 layers. Iced, swirl pattern on top, combed sides, awaiting almonds. 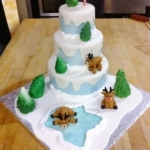 This cake was probably the highlight of my week, as it’s what I most love to do… ice and decorate. It tastes pretty darn good too! At the end of the day we made some chocolate stencil paste to be used tomorrow. I seriously sucked at taking pictures today. I was just not on top of it, and it’s a shame because we did a lot of cool stuff that I don’t have pics of. 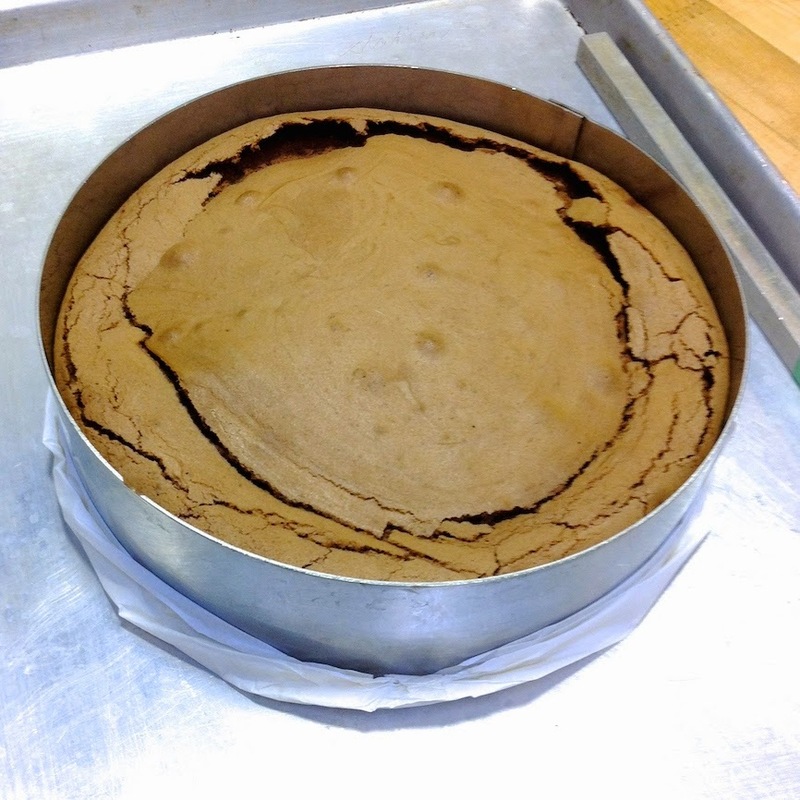 We started entremets today, which are basically layered mousse cakes (aka delicious). We’ll be doing them for quite a few days, so I’ll try to be better about taking pictures. There are different ways to do these, but they all start with a round cake ring lined with acetate (at least I think they do). 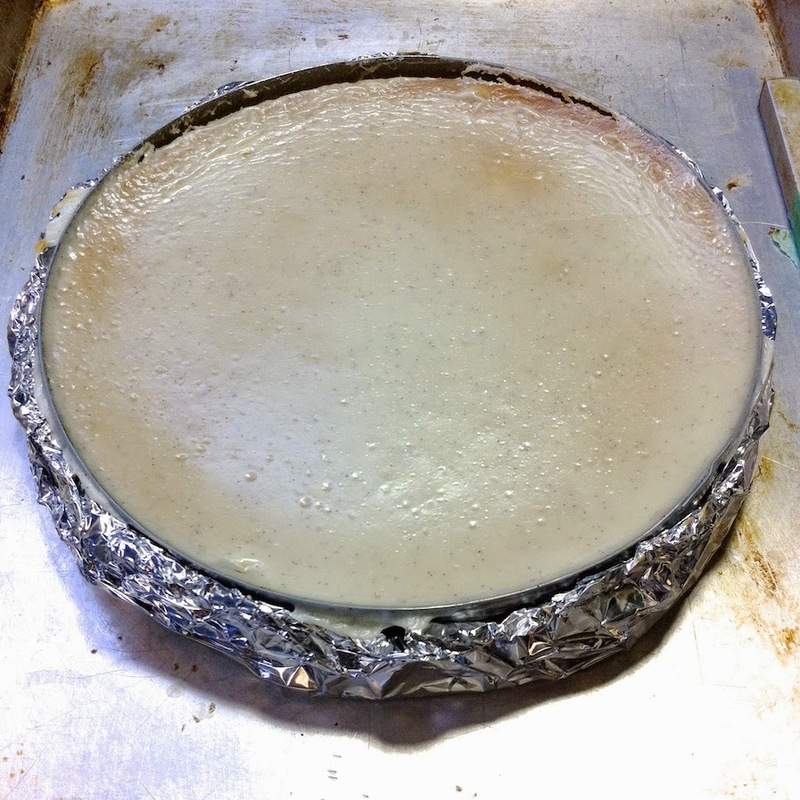 For the one we did today, we baked up a thin layer of Jaconde cake, which is a soft, pliable cake (as long as you dont overbake it). 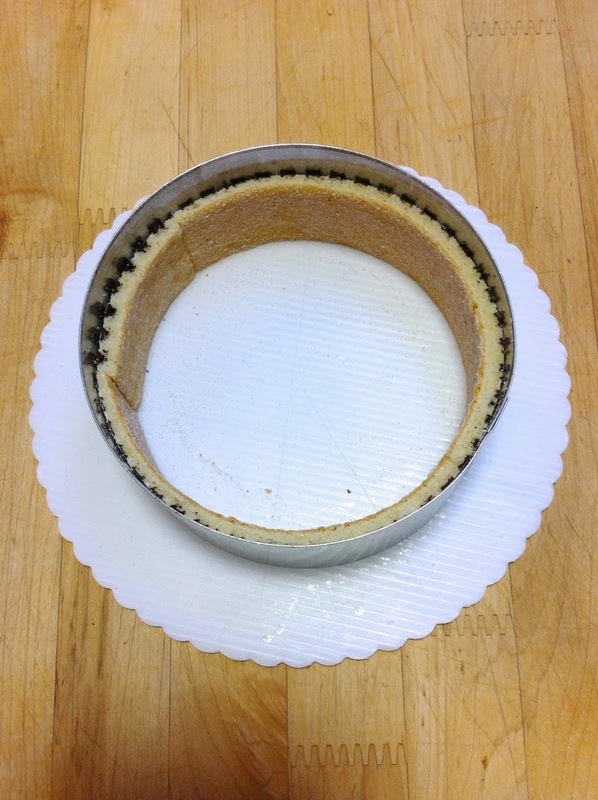 First step was to take this cake and cut it into strips, which we used to line the inside of the cake ring. What I should have done was take a pic of the Jaconde before we cut it to fit the ring. To make it we first lined the tray with some of the chocolate stencil paste we made yesterday, ran a comb through it, then poured the cake batter over top. That way you get cool patterns on the cake. You can use anything, even your finger to make these patterns. You can kind of see the chocolate stripes on the outside of the cake in the ring above. 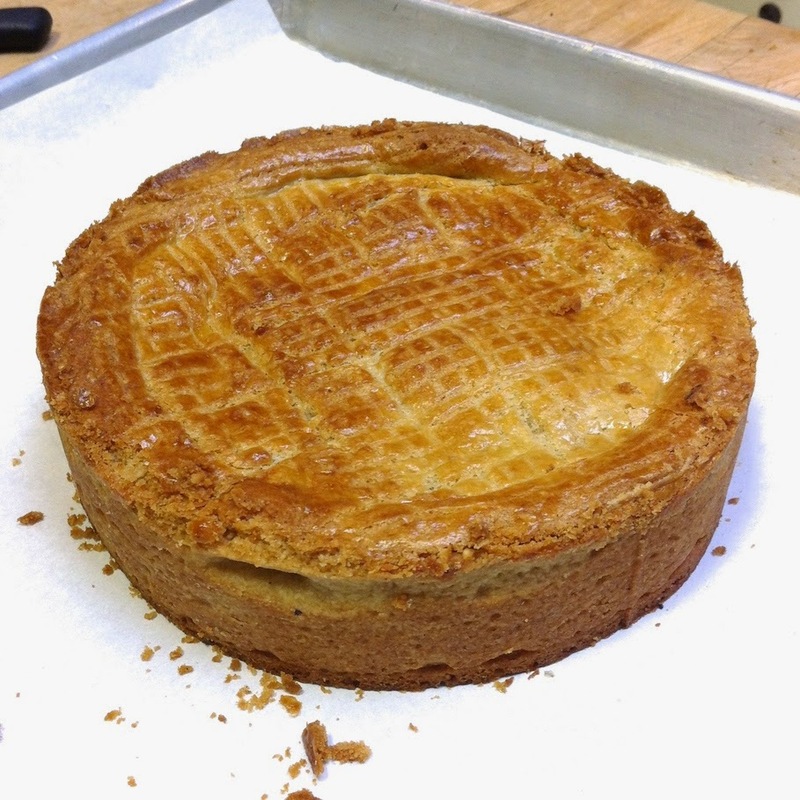 Our Jaconde was actually overbaked, so we couldn’t use it. Thankfully, Chef Stacy let us use hers. 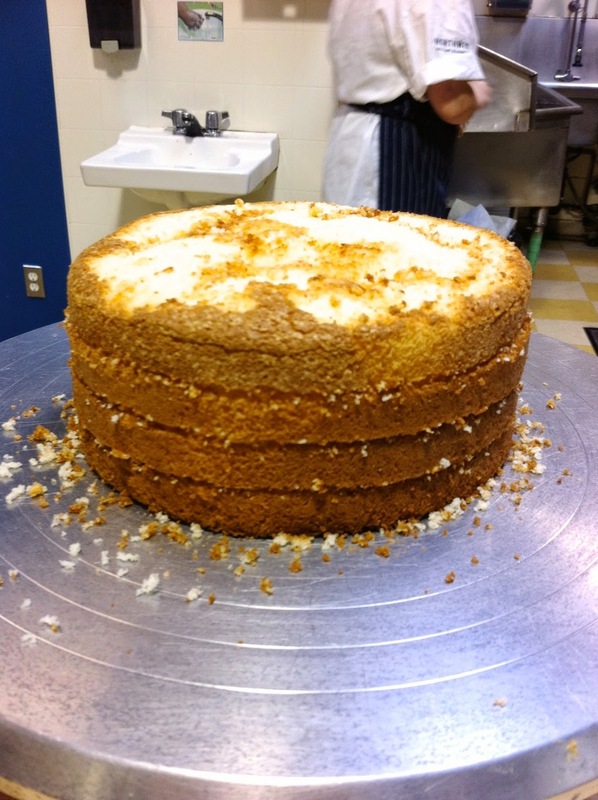 Next step was cutting up the Sponge cake we baked the other day to add as the bottom layer. 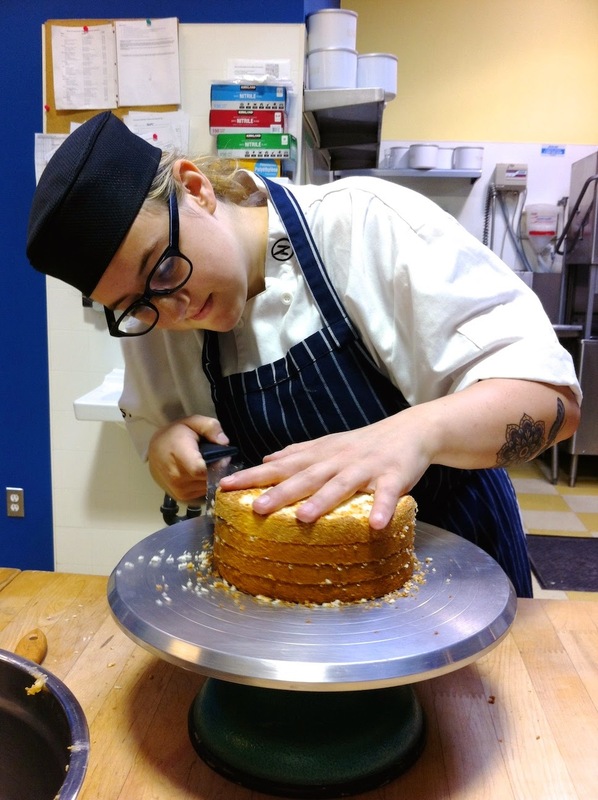 Here’s my partner Haylee doing a seriously awesome job at layering the cake! Seriously, look at those perfectly cut, even layers! I hate using a knife to layer cakes. 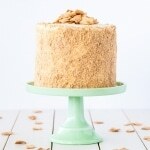 I have a fancy cake leveler at home that makes the job so much easier! 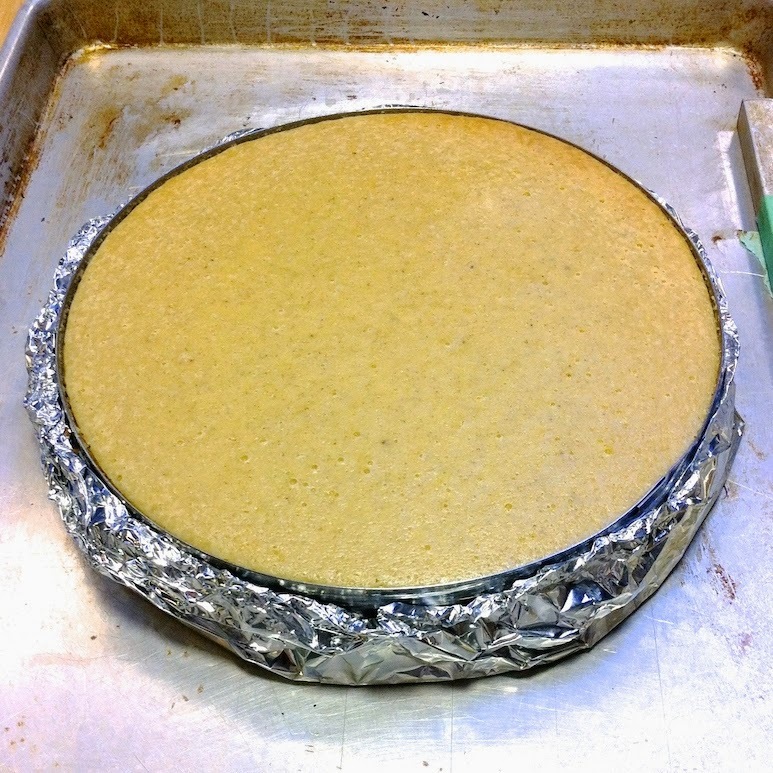 The first sponge cake layer inside the ring. Now the next photo I should have taken is the one where we put a layer of raspberry mousse in the cake. Instead, I got a shot of another layer of sponge over the raspberry. You can kinda see the pink peeking through if you look really hard. Finally, we topped it with mango mousse and left it to set in the fridge. We left these in the fridge over the weekend to set fully, so you’ll have to tune in next week to see the finished product! I seriously hope there are no issues with de-molding. We’ll also be decorating this cake on Monday. I think that involves a layer of glaze and some chocolate curls that we made today. 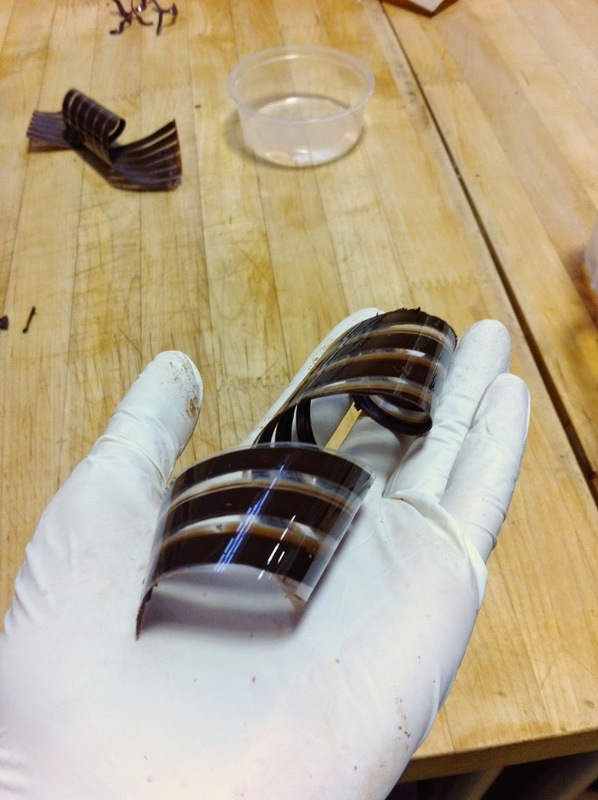 To make these, we poured tempered chocolate over a layer of acetate, ran a comb through it, then quickly twisted it and let it set. They set pretty quickly. Super fragile, so I imagine there will be casualties when taking off the acetate on Monday. We also made some chocolate cigarettes. 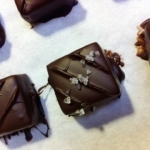 To make these, we spread chocolate out on a marble slab, let it start to set, and then used our bench scraper to press and roll the chocolate. Kinda hard to explain, but I’m sure there’s a video out there somewhere of how to make these. For the first time since I started school I can honestly say that I really enjoyed the week. Maybe it’s because we were working on cakes, maybe because of my partner, likely a combination of both. We’ll be doing cakes for a couple weeks still, so I look forward to that. 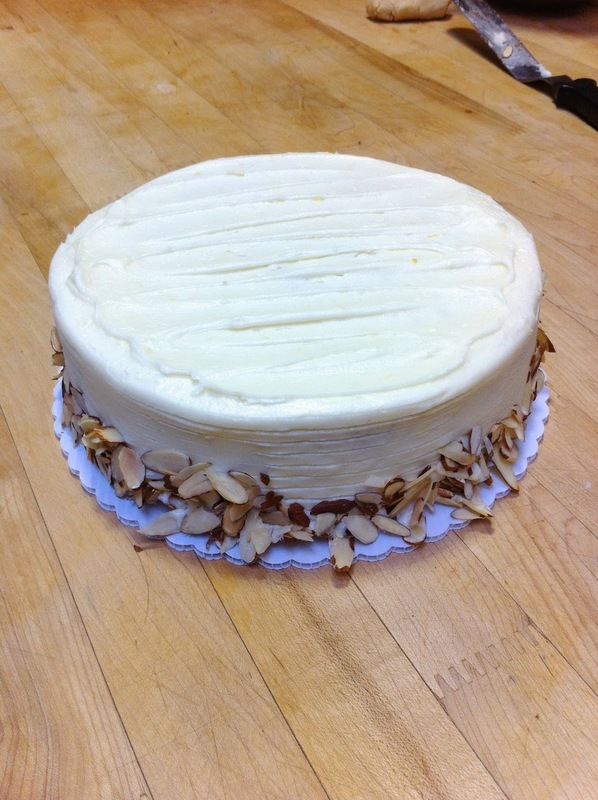 We have a big Entremet project coming up where we have to come up with an idea and create our own. It’s a little bit stressful, but also exciting because I LOVE cakes and making things look pretty. I’m not super stoked on coming up with flavor combinations, but I love coming up with decorating ideas and possibilities. I’ve already got some ideas (thanks to Ryan’s help) and it will be right before Halloween, so I might do something themed (SO exciting!). 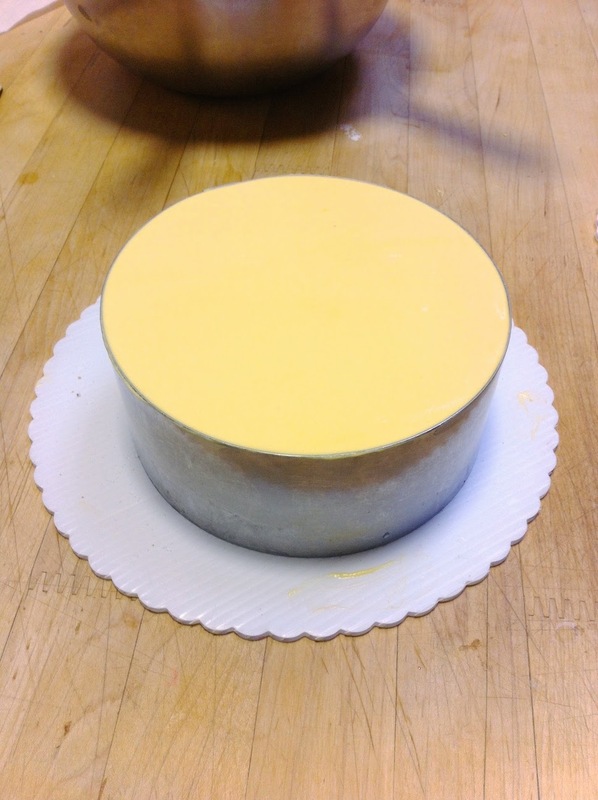 Aside from the actual entremet itself, this project involves a written report of why we’ve chosen the flavors we have, with detailed recipes and methodology, plus costing which we’ll be learning about this week. I’m not as excited about the report part of this (obviously), but am eager to learn about costing since it’s been something I’ve struggled with in the past. Just how much do you charge for that cake that you spent 30 hours baking and decorating? ?